We can all pretty much attest to the fact that rabbits are cute. However, being that they are cute and rather harmless doesn’t negate the reality that the rabbit population being so large could quickly manifest your yard into a rabbit warzone. Digging holes into your ground you’ve spent weekends mowing to perfection. Eating all of your vegetables from your garden – Pretty much burning your carrots at the level of annoyance and frustration! Start forking your garden to prevent those big tooth eaters from eating away your food. It may look crazy, but it works. It is also equally great if you have a cat that likes to dig. Homemade alternatives to store-bought repellents is a safer approach to deterring those rabbits as you don’t don’t want to hurt them just keep them away from your prized harvest. A little bit of cayenne pepper, tabasco, dish soap, water, and eggs will do the trick. Mixture tutorial. 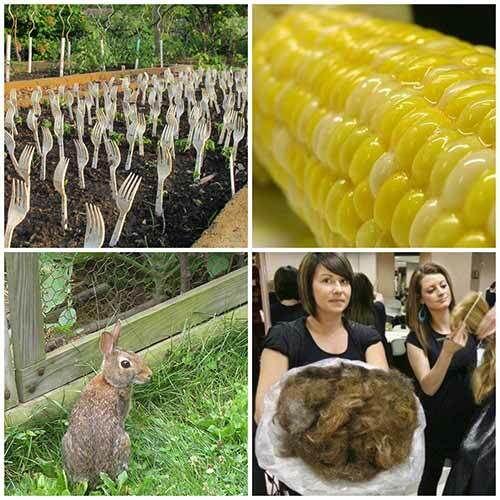 See 18 more deterring ways to keep rabbits out of your garden on the next page!